“What’s for dinner?” flashes across my screen as I’m grabbing my phone and packing up to leave the office. It’s the same text my son sends almost daily; the dreaded question. I feel a stab of irritation- irritation because a) I have to make dinner b) I have a zillion things to do and very little time to do them, before rushing off to whatever evening activity is on the agenda that day, especially when you factor in my commute home and c) because I don’t have a plan. And I hate not having a plan. 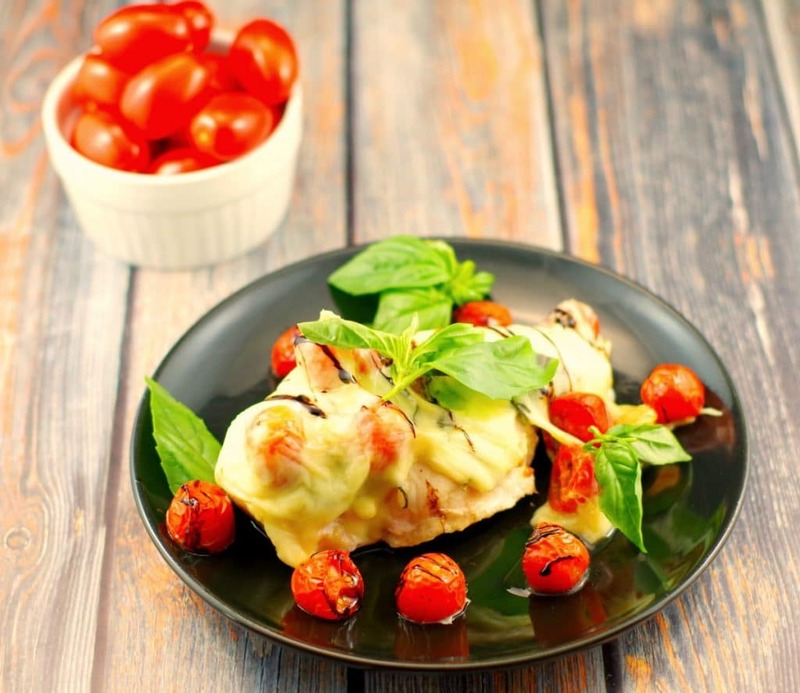 If this sounds familiar, read on…It’s actually the very reason I create simple and quick weekday dinners that can be made in under 30 minutes, like this 5 Ingredient Caprese Sheet pan Chicken Breast recipe (Gluten-free). And it’s only 4 Weight Watchers Freestyle Smart Points per serving! I don’t have air conditioning and it’s been a hot summer, so I’ve avoided turning on the oven. And if there’s one thing that excites me about fall, it’s turning on my oven! 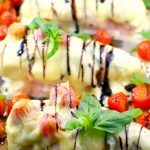 I love to bake just about anything and this Sheet Pan Caprese Baked Chicken Breast recipe is my new favourite baked chicken! Although BBQ’ing almost daily has been nice, I’m anticipating all the deliciousness that will come out of that warm cocoon this autumn. 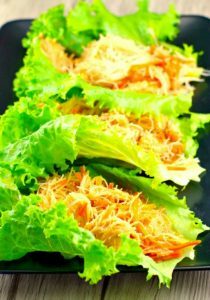 I love chicken because it’s healthy, easy, low-fat and you can add just about any flavour combination to it. 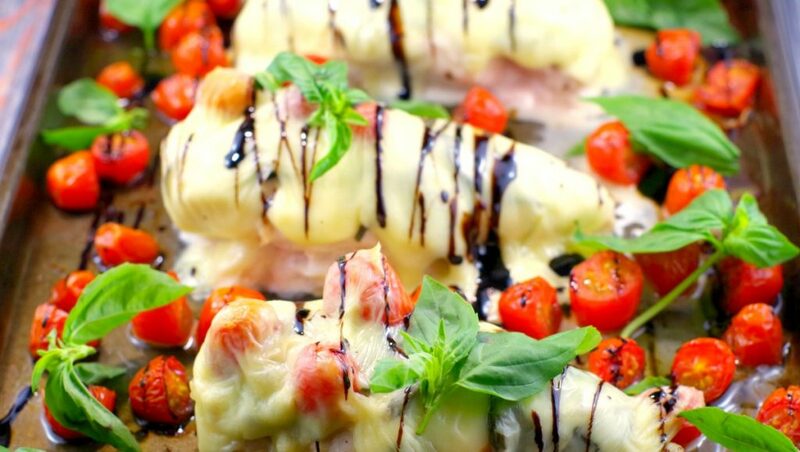 But this medley of basil, grape tomato, mozzarella cheese and balsamic glaze really makes this chicken sing! And sheet pan chicken is nothing short of brilliant – it’s fast and one pan, which means less dishes to wash. And less dishes is always a bonus. 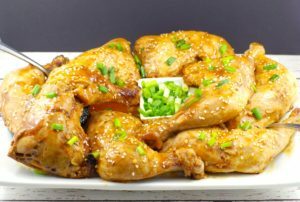 If you are searching for easy, fast, healthy, low-carb, Weight Watchers Friendly and low calorie chicken breast recipes that are gluten-free, this 5 ingredient baked chicken is the one! Fall always signals the start of getting back into routine. And as a new school year begins, so do activities and busy evenings. 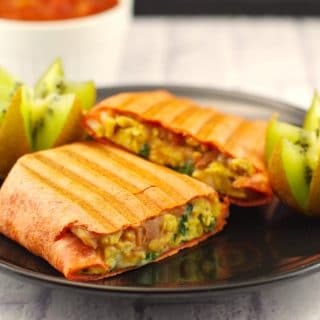 Having an arsenal of quick, easy and delicious dinners in your back pocket can be very comforting. A quick stop at the grocery store for a couple ingredients and you have yourself a plan! 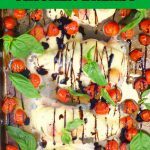 Caprese Sheet Pan Chicken Breast Dinner (gluten-free) was inspired by my fave Caprese Salad Skewer appetizer. 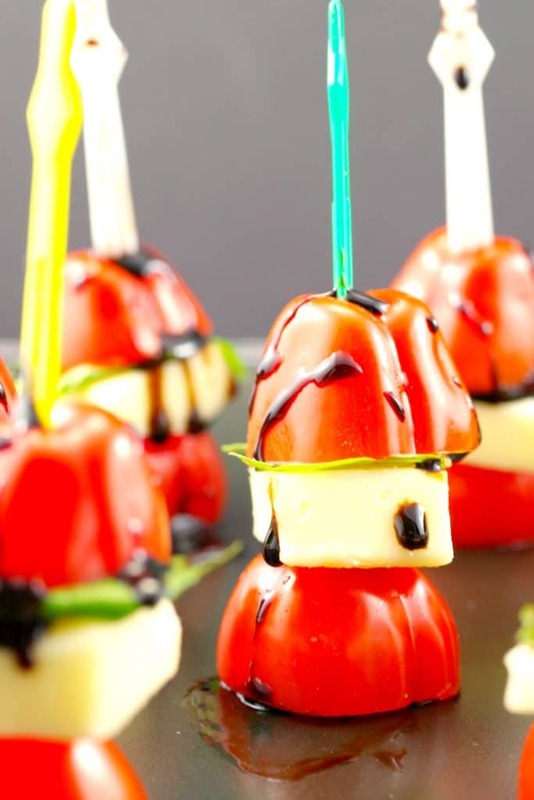 It's a quick 5 ingredient chicken dinner with basil, grape tomatoes, mozzarella cheese and reduced balsamic vinegar glaze and can be made in under 30 minutes. 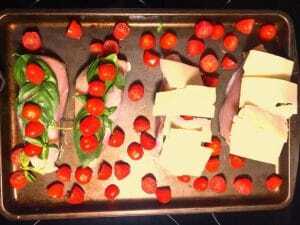 4 Weight Watchers Freestyle Smart Points! Spray a baking sheet pan with non- stick cooking spray. Preheat oven to 350 degrees F.
Add about 3-4 whole basil leaves to each chicken breast, then about 5 1/2 grape tomatoes (or however many you can fit). Top width-wide with cheese slices. Add the remaining grape tomatoes to pan and cook for about 25 minutes, depending on thickness of your chicken breast. When chicken is done (no longer pink inside) remove from oven. Hey Terri! 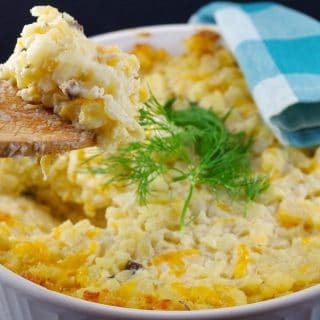 This recipe looks great and I will be trying it. However, the link to the reduced balsamic vinegar glaze takes you to amazon.com and the glaze does not ship to Canada. Is there another glaze that you would recommend that I can buy here in Calgary? Hope you enjoy it- I loved this chicken! I bought the reduced balsamic glaze at both Co op and Sobeys. Thanks for pointing out re: not shipping to Canada- I need to see if I can get that sorted out. This was super easy to make and delicious 😋 Even my kids (11 & 9) really liked it and went in for seconds! We will definitely include this recipe into our regular rotation 😃 I made an olive oil/garlic spaghetti to go with it as well. I’m glad you and the kids liked it, Cresta! And that olive oil/garlic spaghetti sounds fantastic! Gotta love sheet pan dinners! This is such a family-friendly meal. Easy and delicious, and hardly any clean-up!